A boy teased for being "different" was flooded with comforting messages from dozens of celebrities over the weekend. This comes after he expressed his daily struggles as a victim of bullying in a heart-wrenching video posted online. 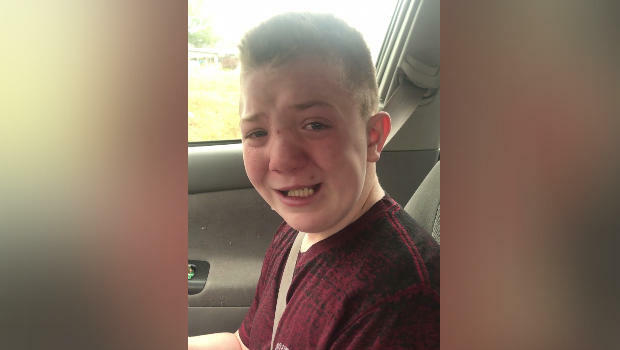 On Friday, Keaton Jones of Knoxville, Tennessee, described the painful ordeal to his mother Kimberly in a Facebook video, where he breaks down in tears. "They make fun of my nose, they call me ugly," Jones said. "I have no friends." During lunchtime, the bullying turns from verbal to physical, Jones says. According to his mother, the boy asked her to pick him because he was afraid to eat with his schoolmates. "They pour milk on me and put ham down my clothes, throw bread at me," the boy said. He tries to reason with his bullies, saying, "People that are different don't need to be criticized because it's not their fault." Still, Jones offered advice to victims of bullying and how they can handle it. "If you're being made fun of, don't let it bother you," Jones said. "Stay strong I guess. It's hard. It will probably get better one day." The powerful, emotional video of his experience at school quickly went viral, amassing to more than 21 million views and 400 shares on Facebook since it was published, and it reached even more eyeballs as it spread to other social platforms. On Twitter, hundreds of tweets surfaced with the #StandWithKeaton hashtag. It also grabbed the attention of celebrities across the different industries, who pledged to help Keaton in any way they can. On Instagram, rapper Snoop Dogg reposted the video of Jones while offering words of support. "Say lil Man U gotta friend in me for life hit me on dm so we can chop it up love is the only way to beat hate," he wrote. "Captain America" star Chris Evans was also the among high-profile actors to step up for Jones and even invited him to Los Angeles for the premiere of the next Avengers movie. "Stay strong, Keaton. Don't let them make you turn cold. I promise it gets better," Evans wrote on Twitter. Another Avengers actor, Mark Ruffalo who plays The Hulk, also tweeted his support saying Jones is "about one of the coolest kids I have ever seen! Can't wait to meet you in person, pal." Tyler Bird, a wide receiver for Jones' hometown team, the Tenneesse Volunteers, said the team would show up to his school Tuesday. "We going to the middle school next Tuesday show young Man some love we will also TWITTER LIVE some of it so everyone can show there love and support," he tweeted.